Here’s one we got a look at during Interbike! The new Sean Morr signature Connoisseur frame from Stolen Bikes. 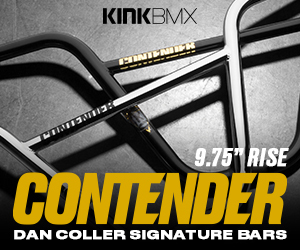 The Connoisseur frame is made from fully heat-treated 4130 chromoly tubing with a 75-degree head tube angle, 71-degree seat tube angle, 9.25″ standover height, 11.8″ bottom bracket height and a 13.3″ – 13.7″ chainstay length. You can find a taller 5″ integrated head tube, top and down tube gussets, a long butted anti-dent down tube, integrated seat post clamp and laser cut, CNC machined dropouts with integrated chain tensioners. The Connoisseur frame from Stolen Bikes comes in matte black and clear coat raw for colors, 20.75″ and 21″ top tube lengths, a weight of 4 lbs. 10.4 oz and a price tag of $309.99 through BMX shops and mail-orders that carry Stolen worldwide now. You cannot go wrong with graphics by Eben Fischer! Here’s one some of you might have spotted a few weeks back in the Gone Biking In Los Angeles video. Fiction BMX are releasing their Troop Tire in two new camouflage colors; Jungle and Urban. The Fiction Troop tire is an all around tire that has a deeply grooved directional treat pattern that is ready for any style of riding you are getting into. They are available in a 2.30″ size, have a 65 PSI rating and weigh in at 28.8 oz. The Jungle Camo and Urban camo tires cost $24.99 each. If you aren’t feeling the camouflage, Fiction also offer the Troop tire in black ($16.99) and gum ($17.99) colors. Hit up your favorite BMX shop or mail-order that carry Fiction to get some ordered up today! The Gone Biking crew are back at it again. This time around they strapped the GoPro on for a full day of cruising spots in Los Angeles. As expected, they came across a bunch of real good spots and ended up with some dialed clips. One thing in particular that caught our eye are the camouflage tires that Sean Morr is running… It sounds like Fiction will be releasing them in the near future! These Pro Part BMX videos that Ride BMX have been producing have been real solid. Today we get a look at Sean Morr‘s section that is grind after grind of rail destruction on spots out in California. Take a look! “Sean Morr rides with power and speed, and for his Pro Part he pretty much stuck to rails… something that’s a little less-often seen these days. Don’t get me wrong, Sean gets into some technical set-ups, but they’re usually accompanied by a larger spot situation. Sean Morr hasn’t put out a full section in a little, so we’re stoked to be premiering this for your guys’ viewing pleasure… Cooked up late last year. Have you ever wanted to learn how to do a smith grind to 180 out? Well, here’s your chance to get some insight into how it’s done by Sean Morr who is no stranger to putting his pegs to heavy use. Let Sean talk you through it, along with a bunch of examples… Hit play, take it all in, grab your BMX bike and send a few! A little while back, the Stolen Bike Co. team made their way to Salt Lake City, Utah to see just what the place had to offer up for spots for the crew. Check out this dialed BMX video they came back with that is packed full of gold. So many good spots in this and the crew crushed it. Take a look! “STLN Team video put together while in Salt lake city, Utah filming and shooting for the 2016 catalog.